Trading on Betfair Exchange can be extremely lucrative but only when done right. It's important to read and learn as much as you can into what trading is, how it's done, the various strategies and the best trading software to use. In this article, we'll be covering the basics of Betfair trading, although, you can apply this to trading on any betting exchange such as Smarkets, Matchbook or Betdaq. Betfair Exchange is the preferred choice for most traders due to the liquidity in the markets and the advanced software that is available which can help you become a successful and profitable trader. The easiest way to think of trading on Betfair is that it is like buying and selling stocks with the difference being you'll be buying and selling sports bets instead. The way to make money trading stocks is to buy at a low price and sell at a higher price and the same principle applies to sports trading. If we lay a sports bet at a low price and back it at a higher price, we will make a profit regardless of the outcome. We're able to place both the back bets and the lay bets on Betfair Exchange and so no bookmakers are needed. Just one account and a little bit of software to help you make the trades quicker and easier. As mentioned, if we lay a bet at a low price and back it at a higher price, we'll make a profit. You may be familiar with this process if you have done matched betting before and have come across 'arbs' as essentially, this is what trading is. However, you won't find markets on Betfair where the back price is greater than the lay price at the same time and so you must use your knowledge to predict which way the price will go. If you're able to predict this correctly then you'll be able to create trading opportunities to make a profit from. Back bets are when you are betting on something to happen. These are the type of bets you generally place at a bookmaker but you can also place them on Betfair Exchange. An example of a back bet would be betting on Arsenal to beat Liverpool. If Arsenal win, your bet wins and if Arsenal don't win, ie. lose or draw, your bet loses. Lay bets are the opposite to back bets where you are betting on something not to happen. 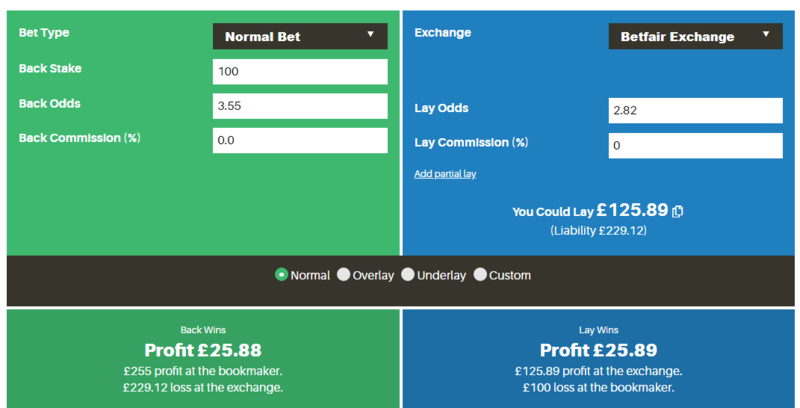 You can't place lay bets at a bookmaker which is why trading is done on a betting exchange. If we placed a lay bet on Arsenal then our bet would win if Liverpool won the match or it ended in a draw and we would only lose our bet if Arsenal won the match. By placing both a back bet and a lay bet, we cover all possible outcomes and if the prices are favorable, we're able to lock in a profit regardless of the result. When making a trade, there are a minimum of two bets to be made, a back bet and a lay bet. If you think the back price will drift, you would place the lay bet first and if you think it will shorten, you would place the back bet first. In the example below, we believe that the back price on Vasiliev will drift and so we decide to place a £100 lay bet on the horse at odds of 2.82. We then wait to see if the price on our horse drifts. If it does, then there is an opportunity to made the trade risk-free and potentially profitable. The image below shows us that our horses price has drifted to 3.55 which is greater than the lay price we placed it at. We now need to back our horse to lock in a profit. This is our Closing Bet. We have two options at this point. We can either calculate our back stake so that we lock in a profit immediately, or we can place a back bet, equal to our lay stake which would mean that we make a profit if our horse wins or break even if it doesn't. The screenshot below shows our return if we back our horse for the same as our lay stake. Now let's take a look at our returns based on the possible outcomes. We now have a risk-free chance of making a £73 profit should our horse win. We could also adjust our back bet so that we make a profit regardless of which horse wins. You can use software for this or even a matched betting calculator. By placing a back bet of £125.89 instead of £100, we're able to make a profit of £25.88 no matter which horse wins the race. Essentially, we have created a profitable arb. Some traders prefer to simply back their selection with the same stake as their lay bet as this is quick and simple and it allows you to quickly make your trade risk-free before the price moves. You can then hedge your bets by placing an additional lay stake afterwards to lock in a profit. If you initially placed a £100 back bet to make the trade risk-free, providing the price hasn't moved, you could then place an additional £25.89 back bet to lock in a profit. There are various trading techniques which you can apply on Betfair Exchange. It's a good idea to research them all and find which ones you are most comfortable with. With all of them you will look to do the same thing - Back at a high price and lay at a lower price. They just have different ways of getting there. Scalping is a common trading technique used on Betfair and any other exchange and involves making trades on very small price movements. Scalping is best used on markets with low-volatility in order to minimise risk. This means betting on markets where the price isn't expect to make any big jumps in either direction. Traders usually back and lay just a couple of ticks apart over a short period. A tick is the minimum movement, up or down, in the price. For example, you could back a draw in a football match at 88 minutes while there is a break in play and lay it a minute later when the lay odds are expected to shorten resulting in a profit. Swing Trading is similar to the scalping method except that you are looking for a bigger price movement. As you are hoping for the odds to move considerably, this strategy is best achieved in volatile markets which means it is higher risk. There are a number of factors which could cause a movement in price such as a player getting injured, the weather at a race track changing or a goal in a match. You need to know when to take a profit and when to cut your losses depending on which way the price swings. It is best to decide on these factors before entering the market and placing your initial bet. Multi-market trading is a slightly more complex strategy to carry out but isn't too difficult to understand. This strategy involves trading across multiple markets in order to lock in a profit regardless of which ones win. An example is if you had layed the score to be 2-1 in a match, if the back odds for under 3.5 goals or over 1.5 goals were better than the odds for for the match to end 2-1 at any point, then you could back the over/under market instead, giving you a greater profit. There is a range of Betfair trading software available which can help you become a more successful trader. Each product is different in it's own way but most will allow you to gain an advantage compared to trading manually, unaided. Quicker Odds - Trading software updates the odds quicker than the Betfair website does, allowing you to be ahead of other traders and get better prices. Multi-Market Views - Using software, you're able to monitor multiple markets at once. Multi-Bets - You're able to place multiple bets simultaneously with the click of a button. This can be extremely useful when dutching. Advanced Charts - Create custom charts with advanced data to help you predict movements in the market and make successful trades. One of the most popular Betfair trading software products is Geeks Toy. The product was launched in 2009 and has been used by tens of thousands of traders in over 100 countries. Read our Geeks Toy review to find out more and how to claim a free 14-day trial. how much money can you make trading on betfair? Some traders make considerable amounts of money trading on Betfair but it's not easy. Don't expect to make enough to quit your day job right away as these successful traders have years of experience in strategies and predicting and spotting price movements. There is a wealth of information available on the do's & don'ts of trading along with various strategies some have found profitable. Be sure to do your research before placing any bets otherwise you could end up losing money. Geeks Toy have a helpful 'practice mode' built into their software allowing you to make trades without risking your own money. This feature can come in very useful when trying out new techniques or venturing into new markets. If you've done matched betting or arbitrage betting before then you'll have an advantage heading into trading over a regular punter as you'll be at least aware of things like lay bets, liability and dutching. However, despite many similarities, there is a lot to learn before you'll be able to class yourself as a pro trader, so do your research. You can start trading with pretty much as little as you like. There's no requirement to make large trades and it's advisable that you don't whilst you're still learning. By starting with smaller trades, you won't be disheartened as much if you make an error and lose money. If you make a costly error with a large trade, it's likely that you'll give up too soon. Start small, a couple of hundred pounds should be enough to place trades of £2-£5 each and test out the various strategies. Hopefully, you'll come across one that you're comfortable with and which makes you a profit. Remember to educate yourself as much as possible prior to making any trades and if using trading software, make full use of the practice mode to minimise any risk even further.